Imogen's Typewriter. 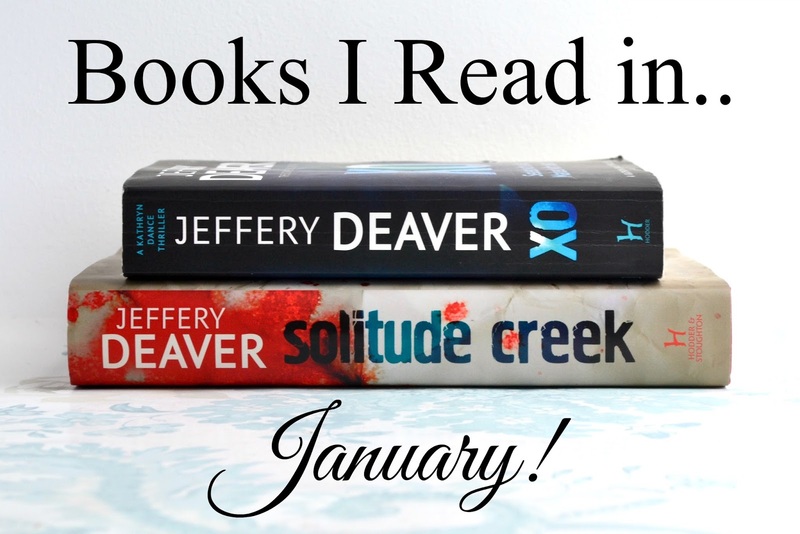 : Books I Read in.. January! So I've hit a little bit of a slump. Probably because I decided to start Orange is the New Black from the beginning and my new university module has started so I've been focusing on things other than reading. I did manage to finish two books in January though, both the continuation of the series I started in December! I have to admit, this is probably my least favourite Deaver I've read. I love his writing, and I love Kathryn Dance but the main character in this novel was her singer friend; Kayleigh Towne, who reminded me of Beth from The Walking Dead in all the worst ways. I missed Kathryn being on her normal stomping ground, I missed her interactions with her kids and I was bored by the plot. It did feature a little cameo from Lincoln Rhyme though which has me looking forward to re-reading that series in the near future. Overall I'm glad I read it because it lead on to Solitude Creek but if I re-read the series in future, I might skip over this one. You may recall this post where I saw Jeffery Deaver talk about his writing and read from this book that I hauled soon after. After XO I was a little hesitant to jump into this one but Deaver was back on form and I really enjoyed it. The antagonist was really original and the idea of murder via mass hysteria wasn't something I had read about before. It did feel like there was a lot going on though, with at least four plot lines intersecting each other in an overly-busy, and there was a weird feminism put-down that felt really out of place but overall I really enjoyed the book. The romantic side of the plot is finally going the way I want it to as well so I'm really looking forward to the next book to see where that goes. "Islands—of times when you’re content, you don’t think about the loss. Now it’s like your world’s underwater. All of it. But the water goes down and the islands come up. The water’ll be there always but you’ll find dry land."